XP-AntiSpy is an utility that let's you disable some built-in update and authetication features in Windows XP. 39712beta is in german only. and why was this posted? I used this program some years ago when I was using XP. Thereafter I assumed it was an XP program. But after reading below & checking the web site I see it also works on 7. I've installed & configured it, no problems. And thanks for the info it's not just for XP. HeilNizar : It is NOT about antispyware it is about to block Microsoft and other to SPY on You ! That is why it has that name. Yes, it is only tweaks. But as i mentioned above....read there. According to the author's homepage, "Suitable for: Windows 2000/xp/vista/7 ". Thank you for a great program. This is a must have that I keep in my tool box. 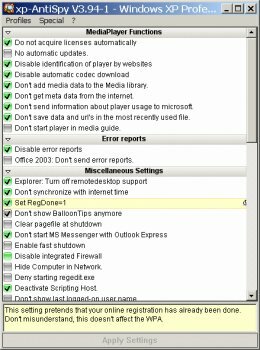 Stop whining XP-AntiSpy will always be a great app !!!!! Well, whatever. I'm just a simple end user and don't know dookie about software coding, but hardwiring ebay into a piece of software like this is just too weird. The software has to make sense to me or I can't use it. Look, with enough determined poking around I can do for myself most of what this program does, but anyway, I looked for Connell's email link. I would rather have said this less publicly. Hey I know a guy has to make a living and I would gladly pay a share for this, but I just cannot tolerate adware. So, Connell do us all a favor and 1)make XP AntiSpy shareware and 2) loose the ebay ball and chain. You are doing great work, my friend! Most of us understand and appreciate the time you have put into this program. And we thank you. You've made a GREAT program, and no the ebay-search in the bottom is no problem at all. Thank you for your effort in helping us to tweeak windows in a secure way., it's really appreciated. * improved the detection of all mediaplayer versions and their settings. * Added little ad from my sponsor eBay to the application. Although this changelog desn't look very big, it was a lot of work, to add support for Windows 7. I hope you do not get upset about the now included ad from my sponsor eBay. But I invest a lot of my free time in the xp-AntiSpy and also I have to pay for my domains, webspace and traffic. So if you visit my sponsor you can help me to keep up developing the xp-AntiSpy without donating any money. Don't misunderstand the xp-AntiSpy goin' adware. This is not gonna happen. None of your private data will be transmitted if you visit my sponsor. A browser will open, and you will be directed to my sponsor redirection script ( http://www.xp-AntiSpy.or...p&search="your search term" ) nothing more and nothing less will happen. You also can close this litte ad by clicking on its close button. If you feel you have to give me some feedback about this or other things concerning the xp-AntiSpy, you're welcome to contact me at any time. ADWARE !!! Blacklist this !! !